Just getting prepared for our St. Patrick's Day celebration tomorrow! 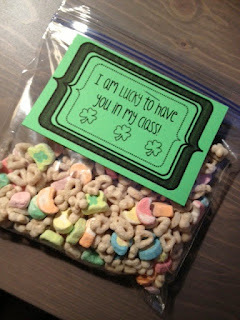 I created these cute "Lucky Charms" bag toppers tonight. For your free copy, click on the image above or HERE. I put together bags for each of my students. My computer is not printing in color right now (not sure how to fix it), so I copied the bag toppers onto green card stock. Makes them a little more festive! They are going to be so excited to have a yummy little treat in the morning!! I have planned to start the day with a little treasure hunt. 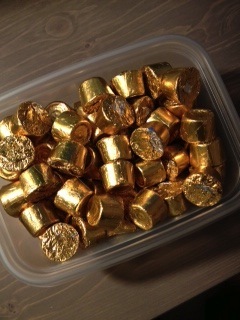 There will be a "pot of gold" (bag of Rolos) hidden somewhere in the room by our friendly leprechaun for the students to find. I found really cute treasure hunt clues on A Cupcake for the Teacher. Our kiddos are going to be so excited! We already had a deep discussion on Friday trying to decide whether or not Leprechauns were real! During math we are going to practice our graphing skills using our Lucky Charms. 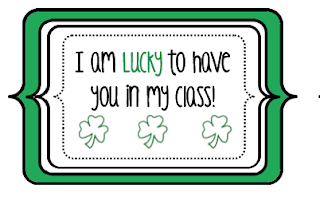 I found a Lucky Charms Math Freebie on Teachers Pay Teachers that I am going to try out. Hope you all have a Happy St. Patrick's Day! !